The second beer on this blog from Montenegro, and apparently it's better! Jelen is one of my favourite beers to drink lots of, so there are high expectations on this beer. 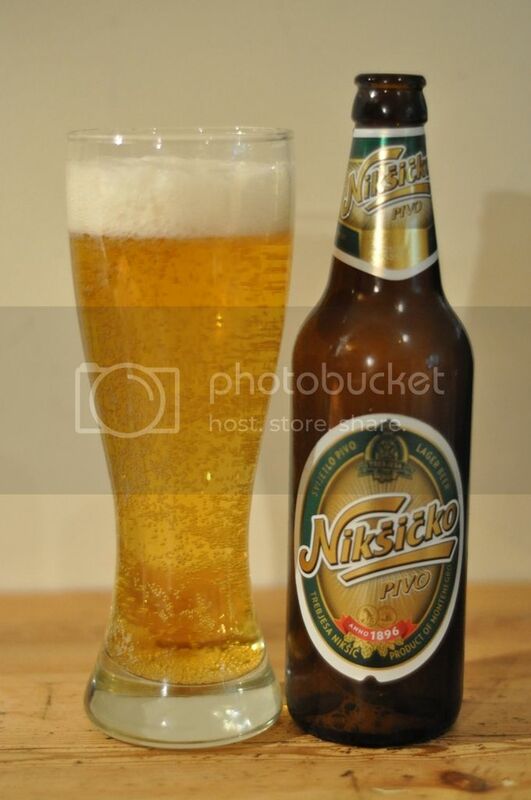 Now, for those who say this is a Serbian beer you are wrong! This is from the Trebjesa brewery in Montenegro, the logo (which is quite hard to see) proves this. A fun fact about this beer is that Montenegro's most famous soccer player (person ever? ); Mirko Vucinic was the head brewer's son, and grew up in the town. It's the most popular beer in Montenegro and has a reasonable following in the surrounding countries. Based on my knowledge of Jelen alone, the beer in this region is quite good, and if this is more popular than Jelen it has to be a serious beer. The pour is excellent on this beer, it looks like any lager you would want to drink. The colour is straw yellow with excellent carbonation and bubbles up the side of the glass. The white head forms very quickly and dissipates almost as quickly. It does leave a small ring of foam, which comes back with swilling but there is no lacing to speak of. Apart from the slightly disappointing head it looks great. This beer is incredibly mild on the nose. Mild levels of maltiness and some acidity are the main smells, but by no means are they overpowering. The hops are quite strong and are of a herbal variety that I am not familiar with. Overall it smells like a pretty standard lager, not overly enticing but definitely not offensive in any way. A really nice malty beer! The taste is very bready with some flowery elements. Fresh grass is quite present but the real crux of this beer is the herbal hops, which are excellent. The hops are restrained and not overpowering, which keeps the beer balanced. The body is very light and the carbonation is nowhere near as high as the bubbles on the glass suggested, it's actually a very pleasant beer. The finish it leaves is very sweet and dry, almost like a wine aftertaste. Overall I'm quite impressed with Niksicko, but it's no Jelen. It's an enjoyably beer, which stands out from other lagers in the area because of the excellent hops they use. If the weather was very hot and humid I would strongly suggest this is the beer for the job, as it's quite refreshing. This probably isn't the beer for dinner though, I just don't think the flavours would mix particularly well with food. However I will try it and report back later. Worth a shot if you ever see it.